There are several memorials to the veterans who served in the five branches of the U.S. Military and those who made the ultimate sacrifice. This tour will take you to memorials in 14 towns throughout the Chicago Southland. You will see everything from helicopters, to tanks, to steel from the World Trade Center. The tour starts in Lansing at the Lansing Veterans Memorial at the Lansing Municipal Airport. The memorial wall is a tribute to all wars with a statute of a solider carrying a fallen comrade to the Vietnam-era Huey helicopter that appears to be landing on the grassy hill. From Lansing, we then head down Interstate 394 to Beecher. 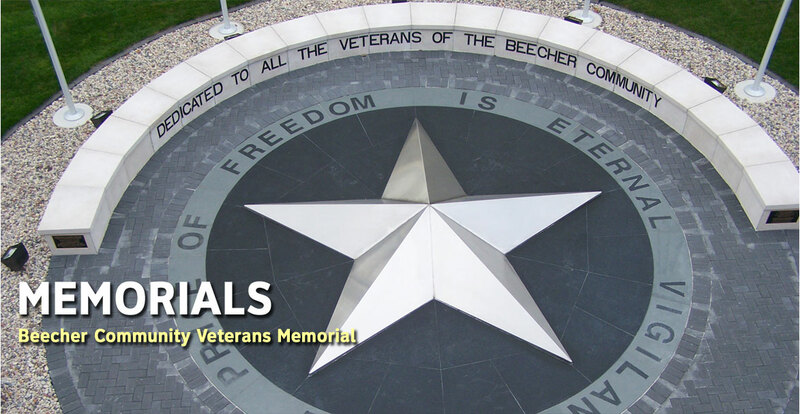 At the center of the Beecher Community Veterans Memorial is a highly reflective 25-foot stainless steel five-point star representing the five branches of the military. Turning back north, we travel up the Dixie Highway to Chicago Heights. At the intersection of Dixie Highway and Lincoln Highway is the Chicago Heights Veterans Memorial. Although the memorial dates back to 1922, the present day mural was completed in 2010 and features figures of five service members, an eagle and inscription that reads "Honoring Those Who Have Served." We next travel north on Halsted Street into South Holland and the South Holland Veterans Park. The South Holland Veterans Memorial features a WWII-era Sherman tank and a monument with plaques that reflect the number of causalities from each war. On the south end of Veterans Park sits five granite plates engraved with the names of South Holland residents who served in wartime. From here, we get on Interstate 294/80 and on to Interstate 80 heading west. On the way, you will pass the 80 by 50 foot American flag in Country Club Hills. One of the largest in the Midwest, the flag weighs-in at 250 pounds dry and 600 pounds wet. Going south onto Interstate 57 and then east onto the Lincoln Highway we head into Matteson. 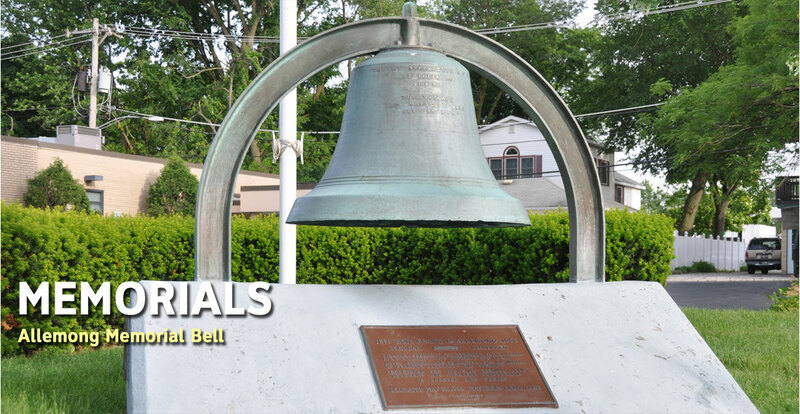 Near the intersection of Locust and 215th Streets, the Allemong Memorial Bell is dedicated to the late Matteson Village President Frank Allemong. The bell is the original village hall bell. Heading back north into Tinley Park, we arrive at the 80th Avenue Train Station in Tinley Park, you will find the newest veterans memorial in the Chicago Southland. The Tinley Park Veterans Memorial was opened in November 2012 and is dedicated to Village Clerk Pat Rea, a retired U.S. Army Brigadier General. To the northeast of Tinley Park is the location of the next memorial, Oak Forest. Located outside Oak Forest City Hall, the Oak Forest Veterans Memorial features a steel, five point star that represents the branches of military service. The star is slanted to create the impression that it fell from the sky, and represents all those who have fallen in action. The memorial also includes commemorative headstones of the first seven Oak Forest residents who died in World War II. Heading west we arrive in Orland Park. 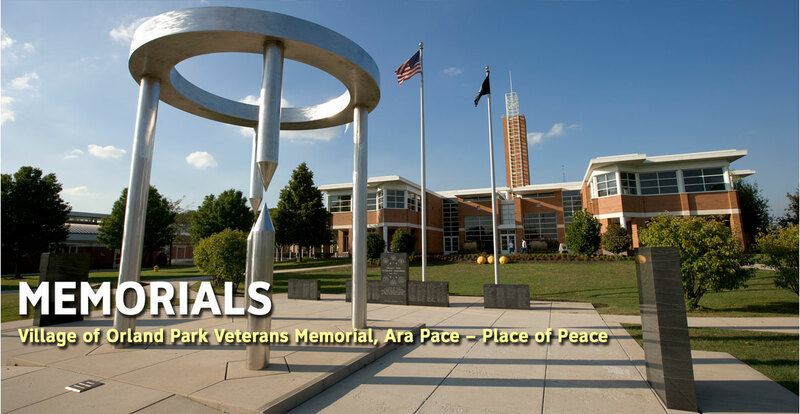 At the Village of Orland Park we find the Village of Orland Park Veterans Memorial, Ara Pace – Place of Peace designed by Virginia Ferrari and debuted in 1995. Heading North into Palos Park you can see the Village of Palos Park VFW Memorial and Blue Star Marker located at Village Green off of 123rd Street. We continue north into Palos Heights. The Palos Heights Veterans Memorial is dedicated to those Americans who died in the quest for Freedom from the Revolutionary War to the Vietnam War. Crossing the Calumet Sag Channel, the next stop is in Palos Hills. The Palos Hills Veterans Memorial features polished stones recognizing each branch of the service. Heading east on 111th Street, travelers can't miss the 16-foot tall Eternal Flame at Harlem Avenue that is the centerpiece of the Eternal Flame Veterans Monument in Worth. Five pieces of interwoven steel make up the eternal flame and represent the five branches of the military. Continue to head east to Oak Lawn. The 9/11 First Responders Memorial utilizes four pieces of steel from the World Trade Center and pillars from renowned sculptor Erik Blome to create a moving display nestled within the Oak Lawn/Patriot Station. Built in 2012, the memorial is a fitting remembrance of those lost on Sept. 11, 2001, and a tribute to those first responders who serve the Chicago Southland. Across 95th Street, the Oak Lawn Veterans Memorial features a polished black stone wall dedicated to all who served, and displays the names of Oak Lawn residents who died serving their country. Head east on 95th street and then south on Pulaski Road. When you reach 118th Street you will come across Veterans Plaza, a public park-like setting dedicated to the veterans and heroes of our nation. Travel north on Pulaski Road then west on 115th Street. Travel south on Cicero Avenue, make a hard right on 119th Street to get to the Afghanistan-Iraq War Memorial across the street from Veterans of Foreign Wars Post 450 in Alsip. The memorial is dedicated to the troops lost in Operation Iraqi Freedom & Operation Enduring Freedom in Afghanistan. Head east on 127th Street to Blue Island for the last stop on the tour. Memorial Park at 127th and California Avenues was created in commemoration of WWI veterans in 1922. Today, an A-7D Corsair II Light Attack Bomber sits on the south end of the park while a piece of historic artillery guards newly rebuilt Memorial Stadium.